While I often write about sports on this blog, I have always done so through a Jewish perspective. In fact, everything I write on this blog I write through a Jewish perspective. 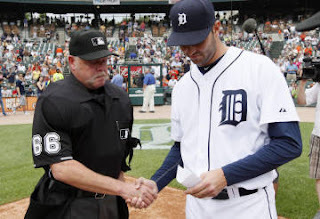 So, why am I writing about last night's Detroit Tigers baseball game in which pitcher Armando Galarraga had a perfect game until the 9th inning with two outs when 1st base umpire Jim Joyce blew an obvious call? Galarraga isn't Jewish and neither is Jim Joyce. And yet, last night in my hometown of Detroit, as I watched Galarraga's perfect game ended by a human error and all the emotional reactions to it, I found the entire episode to be full of Jewish lessons. Perfect games in baseball are a rarity. (It is unusual that Galarraga's would have been the third perfect game this season and we're only a few days into June.) In Judaism, we understand that perfection is hard to come by. We're taught that God created an imperfect world. The concept of Tikkun Olam urges us to be active participants in helping make the world perfect for future generations. But since no human is completely perfect, mistakes are made that constantly keep the world from being in perfect harmony. Umpire Jim Joyce made a mistake last night. His error had significant implications for another human being (Galarraga), but it also demonstrates that in our pursuit of perfection there will always be actions beyond our control that will keep us from attaining our goal. The fact that Jim Joyce was so quick to admit his error and then apologize directly to Galarraga should not go unnoticed. Like every other Tigers fan, and indeed like any baseball fan, I was torn apart watching Jim Joyce ruin Galarraga's perfect game last night. However, the umpire acted like a mensch in his contrition and apology. The Jewish concept of teshuvah (repentance) was brought to mind as Joyce's admission was played repeatedly on ESPN Sportcenter. He admitted that he blew the call without any qualification (something umpires and referees rarely do) and then he admitted that he "just cost that kid a perfect game." There has already been much discussion and debate about whether baseball commissioner Bud Selig should reverse the call and give Galarraga the perfect game that he deserves, and there will be much more on this topic in the days to come. This will also serve as a platform for those who wish to see instant reply brought into Major League Baseball. But what I wish to focus on is what transpired immediately after the umpire's error. Galarraga kept his composure. He didn't yell or scream. He didn't lose his temper and push the umpire. He maintained his cool. After the game, he just shook his head and explained that he'd eventually tell his kids that he threw a perfect game on that night even if the record books didn't record it that way. In an era in which we see professional athletes lie and cheat (see: the Steroid Scandal), get in opponents' faces and taunt them, and hurl profanities at umpires and referees, it was refreshing to see Galarraga take the umpire's mistake like a man -- or better yet, as a mensch. And the fact that Umpire Jim Joyce wasted no time after the game in asking to see Galarraga to offer his deepest apologies also serves as a good example for our children. When you make a mistake, acknowledge it and offer your genuine forgiveness (mechila in Hebrew) no matter how severe the offense. Whether Bud Selig does the right thing and reverses the bad call or not, this episode in one of the American Pastime's greatest games will go down in history as an example of how human error makes perfection hard to come by... and why owning up to our mistakes and asking for forgiveness is such a noble deed. a perfect game. The governor of Michigan has proclaimed the victory as such. General Motors has rewarded the pitcher with a 2010 convertible. But Mr. Selig stubbornly sticks to the mistake. None of us need be perfect, Rabbi Jason. Just do our best.... The commissioner's behavior is deplorable. He's capable of better but won't do it. Now we can wait for another commissioner to come along and right the record.